It all happened because of the war. If it hadn't been for the war, Susan Marcus's dad wouldn't have lost his job when his boss's son was killed in action. And Susan wouldn't have had to move to St. Louis, Missouri because of her dad's new job, leaving behind her best friend Marv and his sister Rose in the Bronx, probably never to see them again. And when they got to St. Louis, it didn't seem like their were any kids on her new block until one day there was knock on the door, a girl her age bearing a plate of homemade welcome cookies. Marlene lives just down the street from Susan, with her mother and little sister Liz and her two grandmothers. Now friends, Susan and Marlene begin playing together, except when Marlene is off with her other friends. That's when Susan meets Loretta, the black girl who secretly lives in the basement with her mother in Susan's building. Secretly, because Jim Crow laws forbide blacks and whites to live in the same building. And before long, Susan learns the Loretta's mother Irene is pretending to be Luther, the building's janitor. But as Susan's father explains, it's hard to find a place to live because of the war, so mum's the word about Irene. Summer in St. Louis is hot and sticky. One day, Loretta invites Marlene and Susan into her makeshift home in the basement where it remains cool and comfortable. The three girls become secret friends and often play games there. One hot Sunday, Susan, her parents, Marlene and Liz head over to the town swimming pool. Before they leave, Susan asks if Loretta can come along. Her dad says no, but he will explain later. A week later, Susan remembers to ask about that day and learns about Jim Crow. Jim Crow makes her angry, and she wants to do something but what? Meantime, Susan also feels the bite of prejudice when one of Marlene's grandmothers makes disparaing remarks about Susan's family being Jewish. Now, Susan is even more determined to do something. The three girls concoct a plan that isn't exactly against Jim Crow laws, it just bends them a little by doing something that people just don't do. The buses in St. Louis are integrated to the point where people can sit anyplace they want. But by what might be called silent mutual agreement, blacks and whites never sit together. The plan is to ride side by side: Marlene, Loretta, Susan. And they plan to integrate one restaurant - the small Chinese restaurant that Susan and her parents liked to eat in after going to the movies. But when the girls witness just how cruel and dangerous hated can be, have they biten off more than they can chew with their plan? For the most part, I like Susan Marcus Bends the Rules. I liked the idea of bending not breaking the law in this case, because breaking could have had some serious consequences and not by law enforcement. This is a mild, though engaging novel, long on period details. Just hanging out and talking, roller skating, playing monopoly and jacks are all things girls did back in 1943. Not having to worry about blackout curtains or air raid sirens because the enemy would never get as far as the middle of the country to bomb it where also nice touches that I have forgotten about. Men sittting around listening to ball games on the radio, while women playing bridge, kids not being closely watched as they are today also added to the historical realism of the novel. I thought the characterization of Susan worked, but her family and friends were not terribly well fleshed out. They felt very two dimentional to me and are what I think of as 'functional characters' - existing for the purpose of moving Susan's story along, but not really developed themselves. I should mention, despite this, the characterization of Loretta was well handled and avoided the usual stereotypical depiction of African American. She and her mother may have been poor, but they didn't speak in a dialect that was incomprehensible and seems to be the way people believe all African Americans spoke in the past. I thought it was interesting that the strongest expressions of hate and bigotry in the novel is against the Chinese people who owned the restaurant and others who owned the Chinese Laundry and who were mistaken for being Japanese. I would have expected to see it against the Loretta because she is African American or even Susan because she is a Jewish girl from New York (with an accent she is trying to lose), particulary since it is Jim Crow laws they are bending. Too confusing for young readers? Maybe, but it would work nicely in school as a supplemental text about WW2. It could help begin lots of conversations about life on the home front. 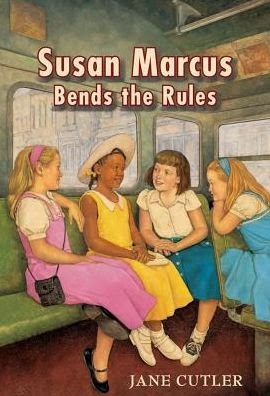 In the long run, Susan Marcus Bends the Rules has enough merit to recommend it and will probably be very well liked by the age group it is meant for. This book is supposed to be available in March 2014 but it appears to be available now. Yes, she probably will like this. And maybe she is a future author. Wouldn't that be nice.